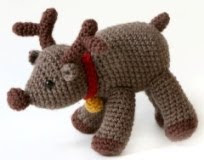 Just use red wool for the nose, and he's Rudolph! Please keep on posting more! I love adding my findings here too, there's sooo many wonderful free patterns for amigurumi out there.